All sanders create dust, some of it highly toxic. Use a good quality mask. 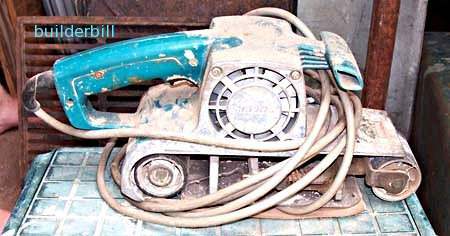 Belt sander, used for sanding on flat surfaces. they come in a few sizes, with the smaller ones (from 6mm to 30) being for specialist jobs. The ones you are most likely to use would be either the 76mm or the 100mm wide. (width of belt). They are very fierce cutters especially with the courser grades of grit. Be careful, practice a bit on scrap first. You can dig in too much very easily. The job I used mine for last was stripping off some nice old jarrah hardwood planks that had been painted years ago. Well worth salvaging. Using an 60 grit belt, I started off cutting at about 45 degrees to the board with light pressure and keeping the sander moving fast all the time. Working quickly over a large area. Never stopping on a small area. I changed to running with the grain for a small while and then finished off with a finer grit about 120, same deal, at 45 deg. then with the grain. I planed the edges with the buzzer, and then used the orbital sander to finish off. I don't know of any machine shop that would have done the job on their thicknesser, old painted timber kills buzzer blades. Good quality belts last a surprisingly long time. 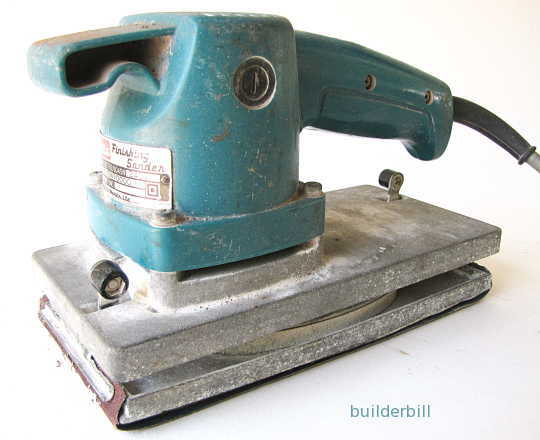 Orbital sander, also used for flat surfaces. I use this for just about every sanding job I do. This is the one that painters use for sanding flush doors down, and light sanding between coats. I usually buy rolls of paper and cut my own to length. Rotary sanders look a lot like an angle grinder, but there the similarity ends. My 180mm Makita is called a sander polisher. It has two speeds, 3200 for sanding and 2000 for polishing. It is fitted with a fairly stiff rubber backing pad that the disks are mounted onto. When I was into windsurfer board building It was my main finishing tool with a lambs wool buffer pad. Like the belt sanders, in the right hands, they are capable of a lot of good work (stripping paint off a boat hull comes to mind) but they are also capable of making a big mess in a short time, because you are working freehand and it is all about a light touch and "feel". Start with finer grit and a non critical job, to get the feel of the action, which way it moves when you apply pressure.